When I attempted to check the data on my location the icon was not showing. This is because there is no url in the place of the icon name when it was snowing. I’m not sure if this is an isolated instance or more widespread so decided to point it out. That’s an intentional part of the design and was taken from the old weather API we used to use. Think about how you can use that code to pull in any icons that suit your design. You can use their icons, of course, but their design is pretty rubbish. Using the code and doing some hunting for other icons you like produces nicer results. 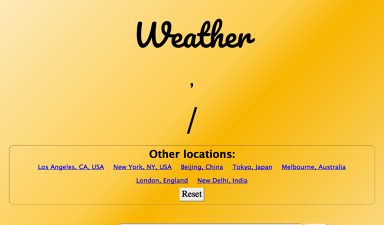 I know they claim in GitHub posts that the data comes from OpenWeatherMap, but OpenWeatherMap doesn’t have this problem. I added different locations for major cities to my implementation and that’s when I saw the problem. 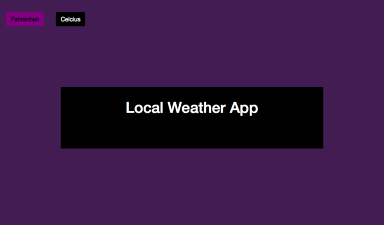 Note that my implementation uses OpenWeatherMap and requires the user to provide their own API key. That’s an annoying quirk for the api I hadn’t seen before. Since the icon data is inconsistent, one could base icon choices on the conditions descriptions instead. I was struggling with how to change the icons to something outside the original api so the inconsistecy with the api data seemed like a roadblock. Thank you for helping me realize that I could use the descriptions I was using to change the background could also be used to change the icons.